Pain Physicians NY (Brooklyn, Queens, Manhattan, Bronx NYC) is one of the first pain management practices in New York to offer an alternative treatment for back pain and Slipped Discs. Depending on severity of the pain we might offer a Platelet Rich Plasma (PRP) injections and Pulse Stimulation Treatment (P-STIM). We are Approved New York State Department of Health Medical Marijuana Facility. Our facility equipped with the most advanced, cutting edge equipment to treat Slipped Discs. Our Brooklyn back pain specialists are best in region. We were selected to be a part of the international medical team for the Rio Olympic Games. Slipped discs refers to a situation when the discs that are found between the spinal vertebrae becomes damaged. These discs are found around each vertebrae to cushion them from shock and allow for flexible movement. 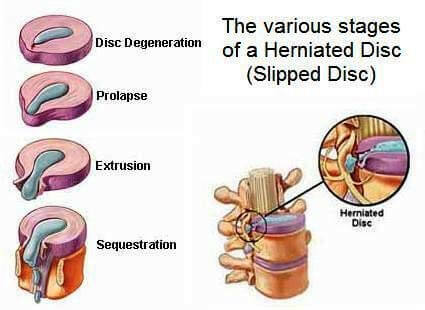 When the disc is damaged, it begins to bulge, causing the vertebrae to sit awkwardly, pressing on the spinal cord and causing pain in the back. The entire spine is made up of 24 individual vertebrae that are arranged around the spinal cord from the lower back to the neck. Around each of this vertebrae is a pad of cartilage referred to as discs. They contain a gel-like substance which is soft and allows for flexibility of the back, allowing for the back to bend and twist. Due to a number of reasons, these discs can become damaged and the gel-like fluid escapes, losing its flexibility. When this happens, the disc may end up sitting directly on the spinal cord or a single nerve root where a nerve leaves the spinal cord. Discs can become weakened with age, gradually losing their flexibility and losing their lubricating fluid. This leaves the individual at a higher risk of a slipped disc, and certain movements can cause the discs to slip permanently. Other individuals at risk are those who are overweight since their spines have to handle a bigger weight. This increased weight causes the discs to wear off quicker than usual, then any trigger may cause the discs to slip. Discs do not slip on their own, even among those at risk, but depend on certain triggers. Some of the triggers that may cause a disc to slip include lifting a heavy load from the ground or turning to lift a load which exerts an increased pressure on the spine. To determine whether your symptoms are caused by a slipped disc, the doctor may conduct a physical examination by feeling around your back for the source of pain. If they are still not satisfied, imaging technologies such as X-rays, CT scans and MRI may be used to identify the cause of pain and the extent of damage. How do you treat slipped discs? Physical therapy is often recommended for slipped disks because this will strengthen the muscles on your back and prevent further damage. Pain relievers may be prescribed if the pain is severe in order to allow you to take part in physical exercises. In the most severe cases, surgery may be performed. This will involve removing the protruding part of the disc, but not the entire disc. Advanced physical therapy are usually recommended, including light physical exercises to strengthen your muscles and avoiding heavy loads that strain your joints. If you experience chronic back pain and haven’t found lasting relief through more conventional pain treatments, medical marijuana treatment offered by our doctors may be right for you. Call medical marijuana doctor Boleslav Kosharskyy MD of Pain Physicians NY with locations in Brooklyn, Queens, Manhattan and Bronx NYC to help you determine if medical marijuana treatment is right for your pain. The most advanced pain management center, Brooklyn back pain management doctors and specialists at Pain Physicians NY offer unique, individualized approach. We are using the most effective back pain management options utilizing the latest technologies available in USA.